Keerzijde: Lang gevoet kruis met monogram van Henegouwen in het hart, in de hoeken lelies en leeuwtjes. 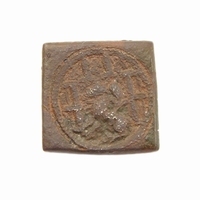 Reverse: Long cross with monogram of Hainaut in centre, lis and lions in the angles. Philip the Good (Filips de Goede or Philippe le Bon) became Duke of Burgundy after the assassination of his father John the Fearless (Jan zonder Vrees) in 1419. He was one of the most powerful and influential rulers of the fifteenth century. In 1430 he created the Order of the Golden Fleece. For the order he chose his personal emblem: the fire-steel which later became a general Burgundian symbol. The emblem of the Golden Fleece and the Collar of the Golden Fleece has been used on many coins since then, it is a very popular design on Spanish coinage. Philip retained the coat of arms of his father John the Fearless, but replaced the single lis with a triple lis. Billon coins: double mite and mite. With the 2nd Emission (Coinage Act - June 11th 1454) Philip introduced a new type gold coin: the gold lion. The 3rd Emission (Coinage Act - May 23rd 1466) a uniform manufacture of the Burgundian guilder was ordered. In 1496 it was replaced with the St. Philippus guilder.